The last major update to the Mini Cooper happened in 2014, two years ago. It was almost a radical change (well as radical of design as a Mini can get), and lots of people seemed to dislike it, although the majority were in favor. With a four-door on the way and a new Countryman launched, the updated version of the Clubman is finally here. This model is offered to the market as a wagon, despite the fact it has nothing to do with an actual wagon, but bear with us since it’s a wagon in Mini terms. Expectedly, a lot of the styling has been borrowed from the hatchback version but not everything. Starting at the front, we find a largely Mini looking face, with huge round headlights iconic to the brand, a downward sloping grille with an S badge on it for the S model. There is also a vent just above the Mini logo and two round fog lights on the side of the bumper. Most of the parts mentioned have a chromed frame around them, which you may or may not find pleasing. Some people think it’s too fussy and flashy, others disagree. Either way, we’ll leave it up to you to decide if you like those. 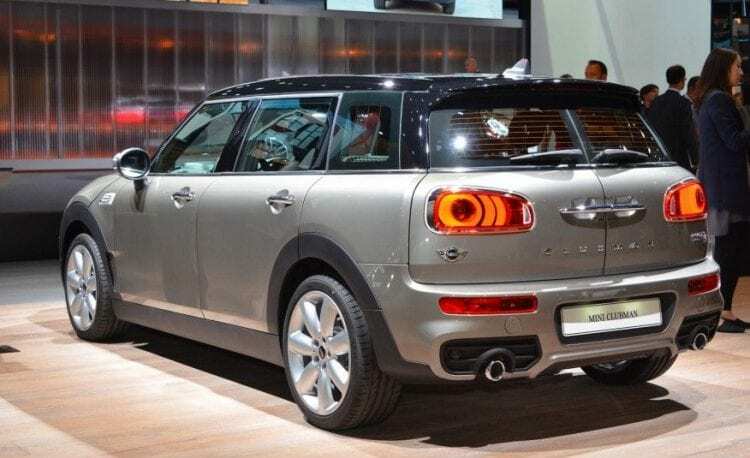 Although the styling is based on the new Cooper, the 2016 Mini Cooper S Clubman is bigger, so it is instantly recognizable and distinguished from its smaller brother. This is especially noticeable from the side of the car where you can really see it’s un-mini like proportions, in the size at least. It’s still nicely proportioned; it’s just that everything is bigger, almost like it’s a Maxi Mini. The rear is nothing like its predecessor which is a good thing you’ll agree. It’s much sportier looking, and the new tail lights and bumper make it look less utilitarian than before. The barn-style rear doors have been kept as they are a trademark of the Clubman after all, but the massive overhaul on the rear fascia including on the exhaust pipes integrated into the bumper give it a fresher and more modern appearance. This is the largest Mini ever built, and we include the large unruly predecessor before it. The thing is since it’s so much sportier and more handsome, you don’t really notice it. It is 12.4 inches longer, wider by 4.6 and taller by 0.6 inches. The wheelbase has also been increased by a decent amount, 4.8 inches to be precise. You get a lot more practicality with this new model which is a plus, but it’s not mini anymore is it? And we mean that quite literally. One of the best things about the 2016 model is that it now gets normal doors for a change rather than the unconventional and unpractical reverse-hinged door located on the passenger side. The base and S models can be easily distinguished since the S has sportier bumpers, side skirts and is littered with S badges. It will also be much more customizable compared to the base models with unique paint options and a lot of accessories. The interior of the car is one of its highlights. It’s easily one of the finest Mini interiors to date and looks very grown-up. The design of the dash still has the iconic round display in the middle, but it’s beautifully incorporated into the entire design. Round seems to be the main shape here. The steering wheel, speedometer, dash display, buttons, and the speakers in the door… everything seems to be round, and it’s a beautiful concept. It really is, and we are glad that it still keeps the recognizable layout all those previous models brought. The materials keep getting better and better. All of the surfaces are soft to the touch, and there isn’t a bad looking plastic in sight. You can tell a lot of money has gone into it which is good, since you are paying a lot of money for the car but more on that later. 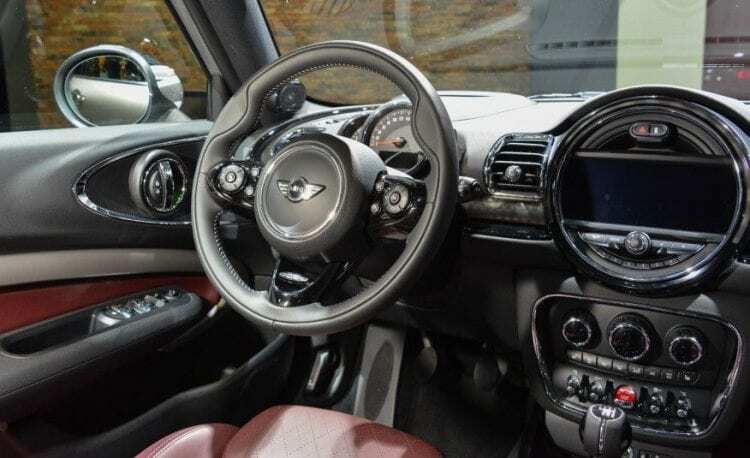 The overall impression is that we are getting features and details mostly met on higher class models but as always Mini comes with few surprises. There are loads of safety systems and infotainment gadgets to play with. The Mini Connected infotainment controls are ergonomic and easy to use and so is the display used to control it. The system works much like the iDrive found on BMWs although it’s a whole lot simpler, something which isn’t all that bad because we could hear many complaints about BMW system. It gets sharp graphics, and you can customize it nearly endlessly. Once you get used to it working with it will be intuitive and fast. The cargo area is decent and can satisfy needs of most people. There is 17.5 cubic feet of room behind the second row of seats. Not exactly the largest of boots but it will do. Folding the rear seats down reveals 47.9 cubic feet, this immediately puts it amongst the top offers in the segment. The biggest positive is that those numbers are much better than the Mini Cooper models, both the two and four doors version. The 2016 Mini Cooper S Clubman ditched the old 1.6-liter I4 unit for a much bigger and more potent 2.0-liter turbocharged four-cylinder. It develops 189 horsepower and 207 pound-feet of torque. It’s pretty quick for its segment, managing to complete the 0 to 60 miles per hour sprint in a very fast 6.9 seconds. It’s 2 seconds quicker than the base model and a few tenths quicker than the old S with the 1.6 four-pot turbo. Top speed is 142 mph which is more than enough allowing you to take on some quite powerful competitors. Power is sent to the front wheels just like in all previous Minis, and there’s a standard six-speed manual transmission to work with. The big news here is the new eight-speed automatic that’s available. The 2016 Clubman is the only Mini to offer this transmission up to date. However, choosing new auto option is only available on S version. There’s also a launch control available which shortens the shift and accelerations times. Although the base version of the Clubman can be had for around $20,000, you’ll have to shell out $27,500 for the Clubman S with the pokiest engine and the most performance. Still, if you’re in the market for a larger Mini but want Cooper S performance, there’s no other alternative. It’s not the best mini ever, in fact, it’s not even that small, but it’s alright we are sure that it will find its place under the sun. Please write more about Mini Cooper! These cars are so underrated.